Over spring break, the Southern Baptist Theological Seminary plans a mission trip to Lakeshore. Several SBTS and Boyce College students have come to work in Lakeshore with their own church groups, so I’m especially excited about this officially sponsored trip. Although I’m a graduate of NOBTS, I feel a strong affinity towards SBTS because of the respect I have for the leadership of president Dr. Al Mohler, the friends I have their, the great things I hear coming out of the school in recent years, and the fact that Lakeshore Baptist Church uses their Abstract of Principles as one of our doctrinal statements. To make plans for the April 7-13 trip, contact Jacob Preston in the Great Commission Center, Norton 108, (502) 897-4594 by March 9th to reserve your spot. Our church and community receives so much encouragement from believers flooding in from all across the country. They particularly love the enthusiasm that students bring. If you come, you will make a very real difference in peoples lives as you bring help and hope in the name of Christ for the glory of God. Mrs. Redford, a 76 year old widow with parkinson’s, and faithful member of Lakeshore Baptist Church, road out the storm with her little dog. She found herself swimming in the storm surge as Katrina destroyed the rental property where she lived. 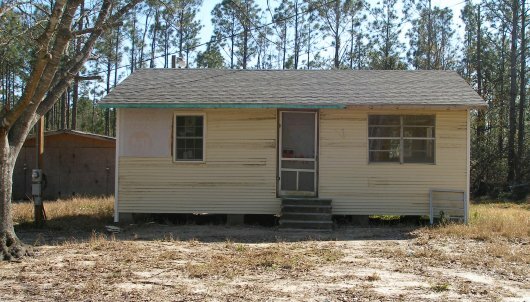 After the storm her family tried to get her to move away, but because of her strong desire to stay connected to her church, she took all the money she had and purchased a small piece of land and a dilapidated flooded mobile home. 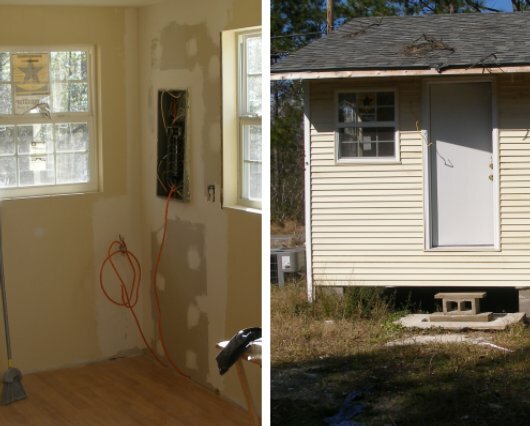 Volunteers gutted the trailer and began trying to rehab it for her to live in. The twisted frame suffered irreparable damage. We quickly realized the futility of sinking money into such a damaged structure. At a church fellowship meal I approached Mrs. Redford and told her I had good news and bad news for her. I began with the bad news, telling her that we could not repair her trailer. She sheepishly understood and thanked me for doing all we could. I asked her if she wanted to hear the good news. She reluctantly agreed to listen. I told her although we could not repair the flooded trailer, we planned to build her a brand new house. She literally jumped for joy as tears of gratitude flooded down her cheeks. 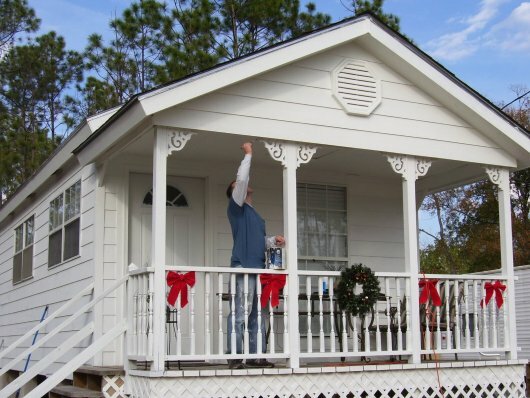 Mrs. Redford now lives in a beautiful comfortable little shotgun house built with 100% volunteer labor and funded with the money people sent in from all across the country. She kept a record of all those who helped by asking them to sign boards. Hear her tell her story in the video below. A great friend, Sarah A., has made a couple of trips to Lakeshore since the storm. Her, her siblings, and their fellow Grace Baptist Church members have provided wonderful encouragement. This past trip, their team served in the kitchen. 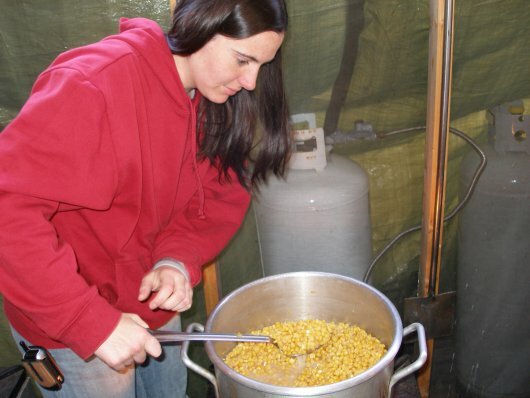 Often teams tell us, as they bring help our way, how much of a blessing they received while working in the relief, recovery, and rebuilding efforts on the gulf coast.. Sarah expressed her’s as “50 Lessons from Mississippi.” She gave me permission to cross-post them here. 1) Working 15+ hours a day is hard and will cause every part of your body to ache like youâ€™ve been beat up. 2) Sometimes itâ€™s not how fancy the food looks or even how wonderful it tastes, but how much love goes into it that makes the difference. 3) Not all ingredients have to be measured. In fact, most donâ€™t. 4) Chapstick is one of lifeâ€™s essentials. 5) No matter how â€œgrown-upâ€ someone is, they can still surprise you by dancing in the kitchen. 6) Little things can become way too big when someone takes it personally. 7) Some of the greatest discussions can be held in a cramped hallway, outside walking through the mud, or in an overgrown storage pantry. 8) If you volunteer to cook the hash browns, you will not be cold in the mornings. 9) The most essential part of the day may be the thirty-second prayer that helps you get out of bed. 10) Sometimes it hurts to smile through cracked and bleeding lips, but it is always worth it. 11) Spending twenty minutes just listening to someone is rarely a waste of time. 12) It is usually more profitable to spend time getting to know your friends (and siblings) than to spend the same time studying in your room. 13) If you hang around and listen long enough, you will probably find out what is bugging whom and why. 14) Even teenage boys get blue when they miss their Moms. 15) There is a great satisfaction in seeing a meal that took two hours to cook be consumed in twenty minutes by hungry volunteers. 17) When eleven determined people set their mind to something, chances are good that it will get done. 18) 5:30 am is a wicked time to have to wake up. 19) At 5:30 am it doesnâ€™t really matter whether or not your clothes match. 20) Giving a back-rub is not only a way to serve someone, but also a great stress reliever. 21) There is nothing quite as wonderful as a hot shower in 45 degree weather. 22) Nine young adults are really no match for 51 kids full of candy-corn. 23) God is glorified through things that may not seem to matter much to us – a yummy meal, a clean kitchen, a squeaky clean pot, a book read to a snotty-nosed four year-old. 24) Godâ€™s Word is as essential to a healthy day as a good breakfast. 25) There are some things that you can still do successfully cloudy brained and half-asleep – making oatmeal is one of them, cooking pancakes is not. 26) If that pot youâ€™re putting away is not clean, send it back to the dishwashers. Keep repeating until itâ€™s clean, no matter how irritated they get. 27) No matter how old you are, you are capable of saying stupid, hurtful things and asking forgiveness. 28) No matter how ticked you are, it is better to forgive and move on than to nurse an offense. 29) There is nothing like a good water fight to clear the air. 30) Soap bubbles in your hair works almost like hairspray. 31) There are several ways to recycle meatloaf. 32) An encouraging word and a hug can do more to lift the spirits than chocolate. 33) A practical joke is like fennel, it only goes well at certain times and only certain people like it. 34) If you are willing to make a fool out of yourself and laugh about it, you will be a much more appealing person to be around. 35) The kitchen is an ideal place to learn cool self-defense moves, especially if youâ€™re working with retired Army and NY policemen. 36) People who jump over bonfires are stupid, however you should probably not tell them so. 37) It is very beneficial to make friends with someone who has lots of vitamin C and is willing to share. 38) In deciding what to wear you should always choose warmth over fashion. 39) If you hang around with a video camera long enough, you will eventually catch your friends doing something incredibly silly on tape. 40) The most essential ingredients in most dishes are salt, pepper, and onion powder. 41) Even if you know a better way, remember who is milking the cow. 42) Go ahead and experiment, but be willing to try whatever you make. 43) Even if it means working late, stopping to go to a church service is always a good idea. 44) There is nothing as refreshing as worshiping with other believers and hearing Godâ€™s Word preached. 45) Singing together gets the job done faster – unless you stop to dance. 46) A sleeping bag and an Army cot feels like a feather mattress and a four-poster if you are tired enough. 47) There comes a point when sleep takes precedence over almost everything else. 48) Much fun can be had with a squid named Steve. 49) Hearty laughter with good friends is almost as relaxing as a hot bath. 50) When you arrive with a plan to serve others, it is almost inevitable that you will come away having been served yourself. Early last summer we gutted Mrs. Bonnie’s house. She hired an out of state person to do some of the rehab and while she was at work, they stole all her appliances. We have picked the project back up and want to see it to completion. We now have the keys. Lord willing, teams coming in the next few weeks will install her siding and soffit, build her a front porch and a back landing, paint her front door, hang the interior doors, set her kitchen cabinets, replace some windows, case in the hallway entry, trim the baseboards, install a vent for her return air, finish the bathroom, and do whatever it takes to get her back into her home. Less than two weeks after the storm, Donnie Stubblefield from Crossroads Community Church and Roadhouse Student Services near Chicago emailed me looking to provide immediate assistance and forge a lasting partnership. With a strong commitment, deeper than words, these folks have gone the second mile with pavement pounding persistence and drive to see God glorified in the rebuilding efforts. We can’t thank them enough for their generosity and hard work. Yesterday we dedicated the second house they helped to build. Lord willing, I’ll have pictures to post soon. Enjoy the video. In addition to the hundreds of teams from all across the country that make long road trips or fly in to help in the relief, recovery, and rebuilding efforts, we also have neighbors closer to home that come. Our friends from Trinity Baptist Church in Baton Rouge LA, about 2 hours away, make regular day trips to the gulf coast to work on several projects. Recently they finished the sheet rock and painted Mr. George’s trailer. We deeply appreciate their dedication and contributions to the ongoing task. Visit the Trinity Baptist Church web site for pictures from some of their trips. You also will want to check out Pastor Dale’s downloadable sermons which they make available via mp3. Compare that to the post-Katrina NASA satellite image of the same location. While the lack of clarity makes detail viewing difficult, you can see the massive debris field strewn in every direction. Look just right of the vertical running railroad tracks along the roughly horizontal running Lakeshore Road to see where the church buildings used to sit. In the middle of the image of the cropped view below, you can see the old church sidewalk as a short diagonal line. The sidewalk used to lead from the front of the church building to the back side of the fellowship hall. Use that as a reference point when comparing the pre-storm Google Earth map. I have not taken the time to create a Google Earth overlay of the post-storm image, but if any technophile out there would like to do so, I would love to see it and share it here. Also, go to Google Earth Hacks web site and download the chilling montage image of the Katrina storm track to see the eastern (bad side) of the eye wall pass right over our church property. The graphic illustrates us taking the brunt of Hurricane Katrina. Its a reminder that when you visit Lakeshore, your standing at ground zero of the storm that devastated the gulf coast. I do not know of any recent satellite imagery that would show the sprawl of our current campus. If anyone finds one, please let me know. Getting water into a house and then back out again requires plumbing skills. Seven of our projects need this kind of work done in order to move them forward to completion. Three new pier construction homes have the rough-in plumbing in place and we need someone to tie them into the sewage systems, hook them to the wells, and set the sinks and tubs. We built another new home on the old slab of a destroyed house. We chiseled the concrete out to make way for the new plumbing. The job awaits a skilled plumber. Mr. George’s rehabbed trailer needs all the plumbing redone. We plan to begin another slab foundation house soon. We have a team building the forms, but we we need to run all the lines before pouring the concrete. We wanted to post this plea, especially for all the teams making plans to be here in the next several weeks. You still have time to try to recruit a plumber to accompany your trip. Or if a plumber reading this would like to make a special trip, we certainly could use you. Contact us so that we can put you on the calendar. Your God-given expertise would serve as a tremendous blessing to these families and individuals trying to get back into their homes. Our friends from Alpine Chapel in Lake Zurich, IL. worked with us last summer and put together this video from their experience. They did a great job of giving you a glimpse of what a mission trip to Lakeshore feels like. Someone stopped by the church property this week and at that moment it seemed quiet. They said, “I guess the volunteer stream has slowed down now that its almost a year and a half later.” I had to smile. The only reason the church campus looked vacant was because everyone was out working on houses. This week we had teams working from New York, New Jersey, Alabama, Tennessee, and two from South Carolina. A team from Hilton Head SC laid Mrs. Lynn’s carpet, poured a landing for her back steps, finished the sheet rock in her bathroom, turned on her power, and several other odds and ends. We plan to dig her well and tie in her plumbing soon. Volunteers from the North Jefferson Baptist Association in Alabama finished hanging the siding at Mrs. Speeds and are pouring the slab for her porch and attached laundry room. They also have a crew finishing the drywall at Mrs. Peewee’s and doing her trim work. The Hood house took a finishing coat of paint and had the light fixtures installed. Electricians from First Baptist Gafney SC wired Stacey’s house. One crew painted Mrs. Bonnie’s interior walls, and another crew painted the exterior of the Patterson’s house. Energetic New Yorkers mudded and sanded Jewel’s sheet rock. 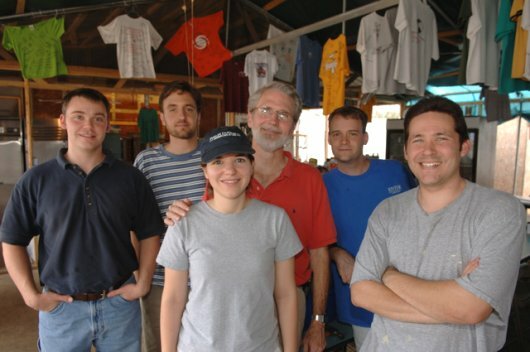 The South Jersey team continued framing Mrs. June’s house and erected the rafters at Sherman’s. they also did a lot of work at Bubby and vickie’s house. The team from Trinity Baptist Church in Baton Rouge is painting Mr. George’s walls today. If I counted correctly, and didn’t leave anyone out, that makes 12 houses we have worked in this week to the glory of God. When these crews head home, we need others to pick up where they left off. Remember, Katrina destroyed every home in Lakeshore. The ongoing task of recovery and rebuilding remains too large to slow down now. Lord willing, we will continue to minister to our storm ravaged community, for a long time to come, through the hard work of God-sent volunteers who bring help and hope in the name of Christ. Please prayerfully consider planning a mission trip to help.